decorate roadsides in Central Texas. 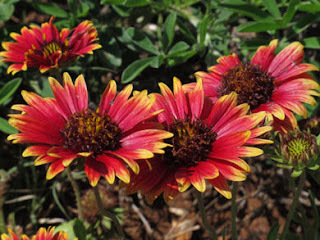 Plan your wildflower drive now. As we approach the end of March wildflowers have really begun bursting into color on central Texas roadsides. The next two or three weeks should provide the best opportunities for seeing bluebonnets, red Indian paint brushes, and numerous varieties of pink, white, yellow, orange, and purple flowers that decorate the Texas Hill Country landscape each spring. If you love wildflowers, now is the time to plan a leisurely drive through the Texas Hill Country. Thanks to winter rains, bluebonnets are reaching their peak earlier this year, although the striking red Indian paint brushes seem to be a bit later. Roadsides and occasional fields will soon be bursting with color. 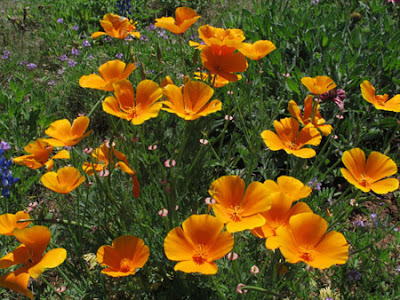 If you decide to take wildflower viewing day trip, keep a few guidelines in mind. Be vigilant of traffic when stopping beside the road, and be mindful not to trespass on private property. Enjoy the sights, and don't forget your camera! In past years, we have headed out from Austin for a wildflower drive, turning west on Hwy 71 towards Marble Falls. We stopped along the highway at several thick patches of bluebonnets—the perfect backdrop for photos of kids and dogs. 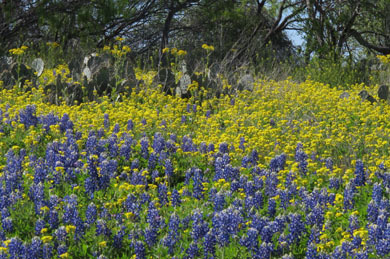 Thanks to seeding by TXDOT, roadsides have sprouted with thick carpets of bluebonnets in many locations. Just be sure there’s ample space to pull off the road and take photos without trampling the flowers. Bright orange claret cups decorated a roadside patch. If you drive by Horseshoe Bay on FM 2147 there’s a long white wooden fence with bluebonnets in front which makes a lovely photo. A gorgeous patch of orange flowers, dotted with blue, pink, red, and purple caught our attention further on. 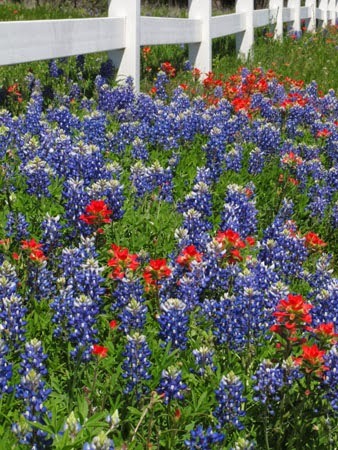 Plentiful bluebonnets lined the hilly, curvy Park Road 4, one of our favorite routes. Several groups of bikers sped by, also enjoying this springtime ritual. Later we traveled on FM 2341 near Burnet towards Canyon of the Eagles. Bluebonnets and huisache daisies cover a roadside field. 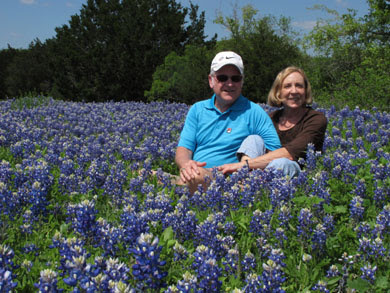 If you get to Llano, look for beautiful bluebonnet displays on Hwy 16 and south of Llano. You might see a large field of prairie verbena near Johnson City on the south side of U.S. 290. The old school yard at Prairie Mountain, which you'll pass on the way to Fredericksburg, is generally filled with pink and yellow flowers that make a lovely photo. As usual, Willow City Loop will likely be gorgeous. If you chose to drive the Loop, remember that it’s a private road through private property, and it’s against the law to trespass (but there's no law against picking wildflowers). Take care and leave the seasonal show for others to enjoy, too. We couldn't resist posing among the bluebonnets! Another area within day trip distance from Austin includes fields and roadsides around Brenham and Chappell Hill. If you head that way, be sure to stop for some Blue Bell ice cream in the city where it was created. I live in the Pacific Northwest now, but I'm a native Texan. I remember driving through East Texas every spring just to see the wildflowers blooming. I sure miss that! Thanks for the beautiful photos. I used to be a traveler and travel writer, but alas, a bum ankle and a bum knee later, no more. I don't have a blog, but put everything on my Web site, www.marthamoffett.com. Please visit. You're welcome. The flowers were lovely this year. This year bluebonnets bloomed earlier than usual. Generally plan a trip the first 2 weeks in April. Hi, Martha, Looks like you keep busy writing. I'd love to have you subscribe to my blog (see above on right).